Happy Family Day Long Weekend! 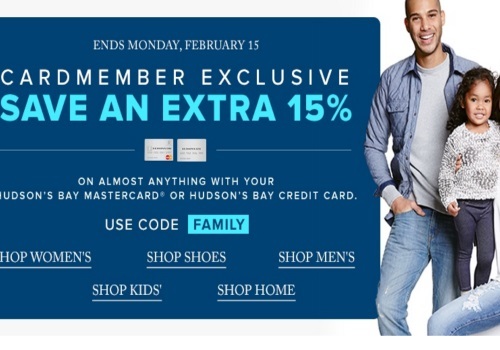 Hudson's Bay is celebrating by giving their Cardmembers a bonus 15% off on almost anything in the store! Get this offer when you shop using your Hudson's Bay Mastercard or Hudson's Bay Credit Card! Enter the promo code FAMILY at checkout. Offer ends Monday, February 15, 2016. Shipping is free on orders of $99 (or $49 in the beauty department).